Virtual Tape Library is a well-proven and reliable technology allowing to significantly accelerate the backup process increasing the tape backup speed. It enhances the 3-2-1 backup rule with several significant benefits and provides seamless data protection against ransomware attacks. While leading cloud storage providers deliver cost-effective object storage, such as Amazon S3 and Glacier, Azure Blob Storage, Google Nearline and Coldline, they don’t always provide a straightforward way to deploy and integrate their “cold” storage tier into customer’s existing infrastructure. Despite many vendors present different solutions for configuring cloud synchronization and managing backups, it is often a challenging task for the IT staff to properly select and deploy the required software or hardware and integrate separate components into a single system. Additionally, it is hard to find backup solutions with “smart” data de-staging for offloading backups first to faster and more expensive storage tier and then to slower and more cost efficient one. StarWind VTL for AWS and Veeam is a solution that ultimately adds the cloud storage tier to the backup infrastructure ensuring the compliance with 3-2-1 backup rule. It provides an effortless integration of the cost efficient “cold” object storage without the need for installing several third-party software components. Implementation of Disk-to-Disk-to-Cloud (D2D2C) backup strategy. Being a variation D2D2T approach, it replaces local tape drives with inexpensive “tape in cloud” storage, delivering higher flexibility and cost-efficiency. StarWind VTL is a Veeam Ready solution. Each software component has been pre-tested and checked for compatibility. It just works! Ransomware can't access and encrypt tape libraries so virtual tape is a safer backup repository compared to NAS or SAN. Additional copies in Amazon S3 and Glacier deliver complete data security even if the entire on-premises infrastructure is compromised. StarWind VTL complements your current backup infrastructure. It creates an additional backup copy allowing to meet the regulatory requirements for having tape backups and significantly decreasing backup costs. The solution increases the backup process speed to avoid the overlapping of backup jobs with production time and ensures the stable performance of the system. What is more, StarWind VTL for AWS and Veeam provides cloud deployment scenario, replacing expensive local storage with cost-efficient cloud storage like Amazon S3 and Glacier. StarWind VTL seamlessly integrates into existing backup infrastructure as a “fire and forget solution”. After the VTL device settings and retention policies are configured, the backups will be stored and automatically de-staged to cloud storage saving time and efforts of the IT staff. 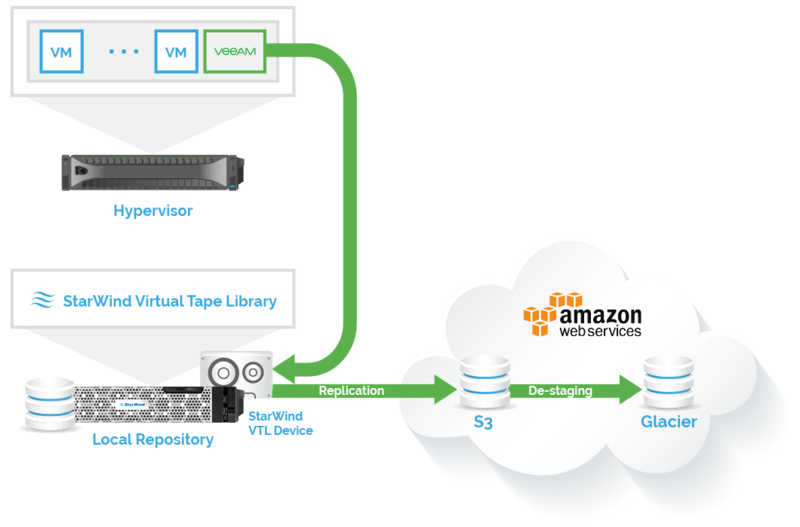 StarWind Cloud VTL integrates a cost-efficient Amazon S3 and Glacier cloud storage tier into the backup infrastructure, eliminating costly tape backup processes and delivering ransomware protection. To download the software product, please, fill in the form below. An installer link and a license key, if applicable, will be sent to the e-mail address you specify. The Release Notes can be found here.